Even though I have been both a chocolate lover and an ice cream lover my entire life, I never used to like chocolate ice cream. Insipid chocolate flavour, sugary sweet, melting in an unattractive greyish puddle, there was no way I was going to eat that. I preferred almost any other flavour, and would pass it up entirely if it was the only thing available. Have I mentioned I was a picky eater, as a child? In 1984, as a “newly graduated from theatre school”, and therefore poverty-stricken young actor, I learned to like many foods at which I had turned up my rather spoiled nose, for years. Peanut butter, lentils, brown rice and yogurt all tasted quite luxurious now, and I could stretch small amounts out for days, in various combinations. One of my Dad’s favourite sayings when we kids complained about Mum’s home cooking was, “A good starving – that’s what you need!” A product of World War Two rationing, it must have driven him crazy to hear us moan about good food. 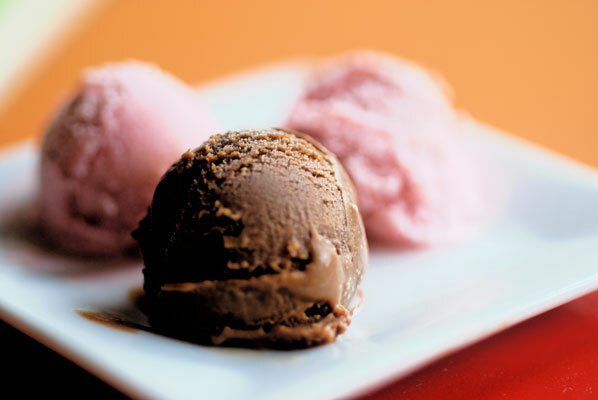 But still – I couldn’t stand chocolate ice cream. 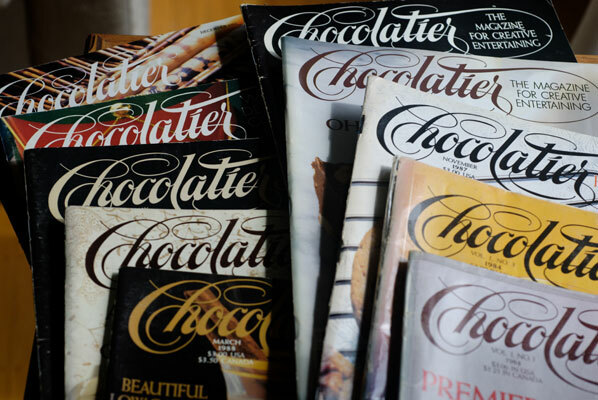 Until that fateful day, when my mother bought me a subscription to a brand new magazine: Chocolatier – the magazine for Gourmet Chocolate Lovers. I fell in love, read the whole thing in one sitting, and immediately sent them off a letter, accompanied by a fabulous recipe for Susan Mendelson and Deborah Roitberg’s Pecan Glazed Torte, because if your letter was published with a recipe, you would win a 3 pound sampler of fine gourmet chocolates, plus any chocolate cookbook of your choice. Imagine what a thrill it was when I opened the second issue and my letter was the first one in the As You Write Us section! I scanned further, and then noticed a small, polite sidebar asking contributors to remember to send original recipes, if they wanted to be entered for the swag. 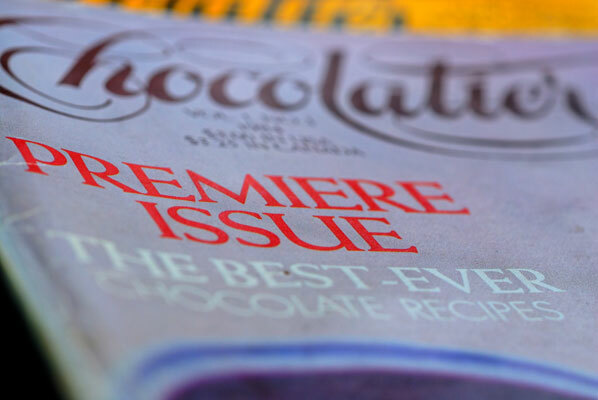 Oh well, it was still a thrill to be in print, and I had to laugh when I leafed through a few more pages to the Chocolate Temptations from Five Culinary Experts article. The first one, beautifully photographed, was for, you guessed it, Susan and Deborah’s Pecan Glazed Torte. 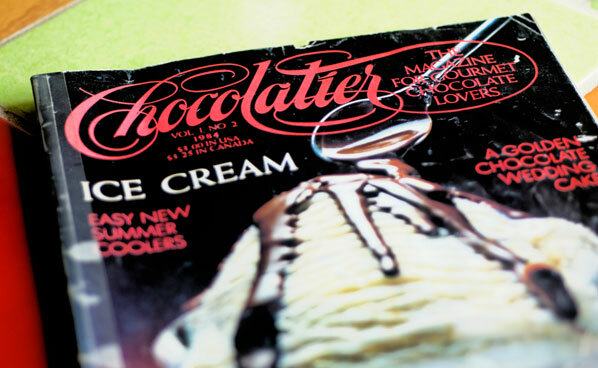 But this second issue was devoted to ice cream. Perhaps it was because my roommate and I were down to our last bagel, but the glossy pictures of four different over-full cones filled with four different variations: sorbet, granita, Philadelphia-style, and French custard-style, on a double-page spread in the middle of the magazine, sent me over the edge. They all looked dark, creamy and delicious. I had to try at least one! I was waitressing at the time, and used some of my tip money to buy the ingredients. I opted for the French chocolate-ginger ice cream, perhaps hedging my bets, as it wasn’t purely chocolate. It contained a whopping four egg yolks ( which meant I’d be eating an egg white omelette for breakfast, next morning), 2 cups of heavy cream, milk, sugar, unsweetened and semi-sweet chocolate, and six pieces of fresh ginger, quarter-sized, peeled and lightly crushed. We lived around the corner from the main street of one of the most vibrant neighbourhoods in Vancouver, so a quick walk to “The Drive” (Commercial Drive) shops and markets, and I was back to our tiny apartment kitchen with my loot. My wonderful room-mate had given me, for my birthday, a Donvier one cup ice cream maker – the kind you cranked by hand – and was dying to try it out. I had been using it to turn fruit flavoured yogurt into fancy frozen treats, but THIS was going to be the true test. I had put the “patented chill-fast cylinder” in our teeny freezer the night before (after chipping out the accumulated frost), just to make sure it was ready. I didn’t want to wait a moment longer than I had to. I heated the cream, milk, sugar and ginger, carefully poured this over the finely chopped chocolate and egg yolks, whisked it all over a gentle heat until it became a lovely custardy cream, whisked until tepid, and set it aside to cool. It was only at this point that I noticed the words: Chill at least six hours or overnight. I think I have mentioned in previous postings that I am not, by nature, a patient person. This is why working with Ecole Chocolat has been so good for me – it is teaching me over and over again that you cannot rush something worth waiting for (think: tempering, ganache ripening, chocolate unmolding). So, I think I went out to a movie, and probably ate red licorice to distract my thoughts away from creamy chocolate things. I strained the mixture, removing the ginger pieces, and finally, got the frozen cylinder out. I got a little over enthusiastic with the amount I thought the tiny machine could hold, but into the cylinder it went, on went the handle, and oh, how I cranked. 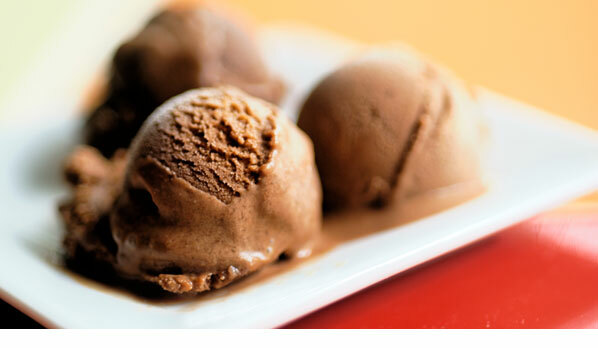 There is something wonderful about feeling the pull of freezing ice cream as it comes together under your hand. After 20 minutes, I had a one cup serving of quite soft ice cream. As I recall (and this is going back a few years!) it was bit icy in some patches, and very smooth in others, but I relished every mouthful of it, savoured every last, ginger-spicy dark and delicious, melting drop. And I was, from that moment, a convert. Chocolate ice cream could be good! And there was a built-in control, preventing me from wolfing down the entire batch, because the cylinder had to be re-frozen after every cup. This is awful, but I can’t even remember if my roommate got any! I still can’t stand the cheap stuff, filled with gelatine and chocolat-y flavour, and you couldn’t get me to eat a Fudgsicle for any amount of money, but since that first batch of homemade ginger-chocolate, I have developed any appreciation for interesting, “not too sweet” flavour combinations, such as bitter orange and chili. Sadly, the recipe I used so long ago (am I really that old?) is not available online, and the magazine is no longer in print. 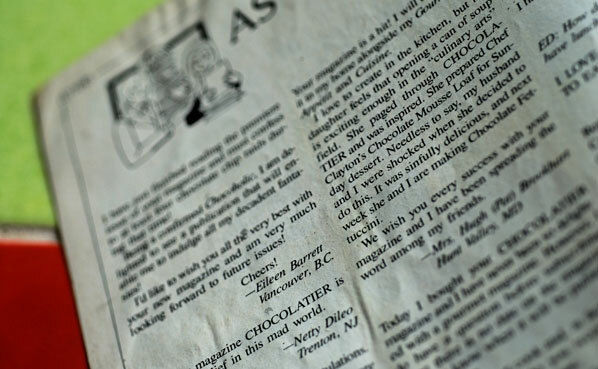 But, just in case your library, or a friend might have it, the recipe I used came from the esteemed Barbara Kafka, and is in: Chocolatier, the magazine for Gourmet Chocolate Lovers, Volume 1, NO 2, 1984. Hmmm, perhaps Chocolate Parsnip will become my new favourite? Place egg yolks and chocolates in large mixing bowl. Slowly pour in hot cream mixture, whisking constantly. The hot cream mixture will melt the chocolate. Whisk until chocolate is blended into cream. Return custard mixture to saucepan. Stir over very low heat, about four minutes, until thickened enough to lightly coat a metal spoon. Remove from heat and whisk constantly until tepid. Set aside and cool to room temperature. Pour into a bowl and apply plastic wrap or waxed paper directly to surface of chocolate mixture. Chill at least 6 hours or overnight. Strain chilled custard into container of ice cream freezer. Freeze according to manufacturer’s directions.